David Gilmour was born in London, Ontario in 1949. He holds an Honors BA in French, a B.Ed., and did graduate work at Victoria College, studying Comparative Literature under Northrop Frye. In 1980, Gilmour became the managing editor of the Toronto Film Festival, a post he held for four years. In 1986 he began his career with the CBC, as the film critic for The Journal. During his stint there, he reviewed more than 300 movies and was eventually promoted to host The Journal’s Friday Night Arts and entertainment segment. Starting in 1990, Gilmour hosted his own program on CBC Newsworld called Gilmour on the Arts. He continued as an arts correspondent with the main CBC network when The Journal was folded into CBC Prime Time News. Then, after a two-year absence, in 1994 Gilmour on the Arts was re-packaged in a new format and later won a Gemini Award. Through it all, Gilmour established himself as a critically-acclaimed novelist. His first novel, Back on Tuesday, was published in 1986, followed by How Boys See Girls in 1991. His third novel, An Affair with the Moon, was published in 1993. Gilmour left television in 1997 to focus on his writing career. Lost Between Houses, published in 1999, was a best-seller in Canada and nominated for the Trillium Book Award. 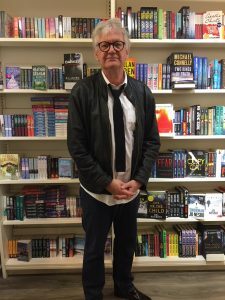 Sparrow Nights, his fifth novel, was published in 2001 by Random House to excellent reviews in The Globe and Mail, The New York Times and Washington Post. His sixth novel, A Perfect Night to Go to China, won the 2005 Governor-General’s Award for fiction and has been translated into Russian, Thai, Italian, French, Dutch, Bulgarian, Turkish, and Serbian. He has two children, Maggie and Jesse, and lives in Toronto. Mr. Gilmour’s latest novel, Extraordinary, was published by HarperCollins in September, 2013.